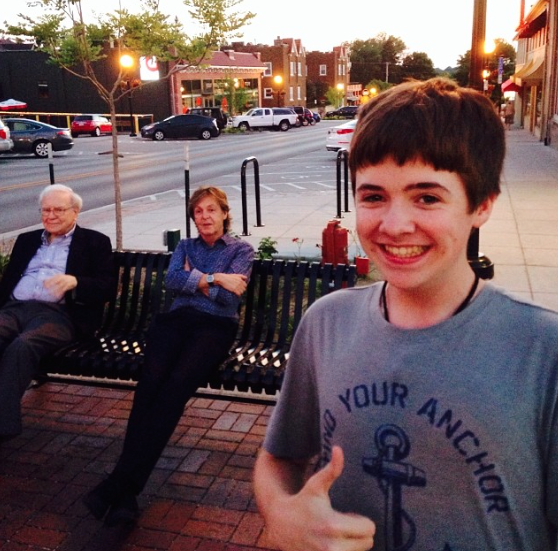 You have probably heard the story by now: a 16-year-old Omaha resident named Tom White is a media sensation thanks to an amateur photo of White grinning with Sir Paul McCartney and Warren Buffett. But Tom White and the three teenagers who helped him create the moment on the streets of Omaha are more than a passing story. They have taught brands a valuable lesson about how to do real-time marketing right. As reported via an interview with CNN, on July 13, White, with the help of his friends Luke Koesters, Jacob Murray, and Drew Tvrdy, captured what appears to be a fortuitous brush with fame. Murray photographed White grinning and giving a thumbs-up while McCartney and Buffett sat casually on a bench looking like they were just shooting the breeze. After White posted the image on his Instagram account, the photo went viral. Within 48 hours, the image accumulated more than 4,800 likes and hundreds of comments. Paul McCartney tweeted the photo, and news media such as ABC, BuzzFeed, and Mashable covered the encounter. Listened. On the evening of July 13, White’s friend Jacob Murray noticed an amateur Instagram post mentioning that Paul McCartney had been spotted on the streets of the Dundee neighborhood of Omaha. In fact, McCartney was in town for a concert and was going out for some ice cream with the legendary financial wizard Buffett, an Omaha resident. Murray did what many brands strive to do on a larger scale: performed some good old-fashioned social listening. Credit Murray for being hyperaware of a rapidly unfolding event. Acted quickly. Uncovering an opportunity is one thing; acting on it is another matter. Murray quickly notified his friends of the Macca sighting. Koesters, Murray, Tvrdy, and White hustled over to Dundee with their smart phones and personal belongings to autograph, including a guitar and Abbey Road album cover. In the CNN interview, note how aware they were of the need for speed. White notes that by the time they arrived at Dundee, the Instagram photo that tipped them off was already seven minutes old — correctly noting that seven minutes is an eternity in the world of real-time marketing. Collaborated. Real-time marketing requires a team. Just as a team at Oreo and 360i was responsible for Oreo’s famous “dunk in the dark” real-time marketing moment during Super Bowl XLVII, so was the McCartney/Buffett moment a team effort. The boys shared a car. Murray snapped the photo. White provided the smile. The boys shared the photo on their social media accounts. Although they did not get autographs they had hoped for, that simple photo gave them sudden fame. Did not overplay it. This is perhaps the most valuable lesson for the many brands that over-engineered real-time marketing during the World Cup, including Royal Dutch Airlines, which caused some blowback by trying too hard to be funny. The Omaha teens did not try to get too cute or otherwise overdo the moment. White’s Instagram contains a simple caption, “Chillin with my homies.” He lets his smile and the iconic image of two famous billionaires do all the work. Similarly, his friends allowed the power of the photo to speak for itself when they posted the image on their Twitter accounts. They all understand that the photo would be worthless without the presence of Macca and Buffett, and they quite sensibly focus the attention of their audience accordingly. Capitalized on earned media. The boys, showing savvy and charm, have capitalized on all the attention the moment has created. You can see them smiling and speaking in sound bytes to the likes of CNN and CNN Money, while providing information and quotes to journalists from media such as ABC and Mashable. Notice how graceful they are, expressing their sincere respect and admiration for McCartney while freely sharing their own stories. Real-time marketing has come under attack for good reason: brands are too often exercising questionable taste and bad judgment, they are trying too hard to be funny, and they’re forgetting that “real-time” is about real-time audience engagement, not chest beating. But four kids from Omaha just reminded us that real-time marketing is a powerful way to create your own news if you do it right. This entry was posted in Digital, Marketing and tagged ABC, CNN, David Deal, Drew Tvrdy, Jacob Murray, Luke Koesters, Mashable, Omaha, Paul McCartney, real-time marketing, Superhype, Tom White, Warren Buffett. Bookmark the permalink.